If the average Eucharistic Adoration staff member or volunteer spends 10 hours per week managing adoration, finding subs, and filling in empty spots, and that staff person or volunteer is worth $15/hour in compensation, then the average Adoration program is costing the parish $150 per week and over $600/month. It may not seem that way, but time is money. Even the time of a volunteer is money because the free time of a volunteer could be spent elsewhere, saving additional staff time. If the use of software can save staff time, it just may very well mean the difference between hiring or not hiring additional staff. With rising costs of all things staff related, software could save even more money than calculated above. Or, money aside, by freeing up current staff time, you liberate them to do more ministry and the tasks they are gifted at doing. Why use paper and pencil in with today's technology? Take a video tour behind the scenes of the AdorationPro Adoration Scheduling Softwarea. Let's face it, getting people to sign up for Adoration can be tough. But, let's also face it, we're probably not advertising Adoration in the right places. 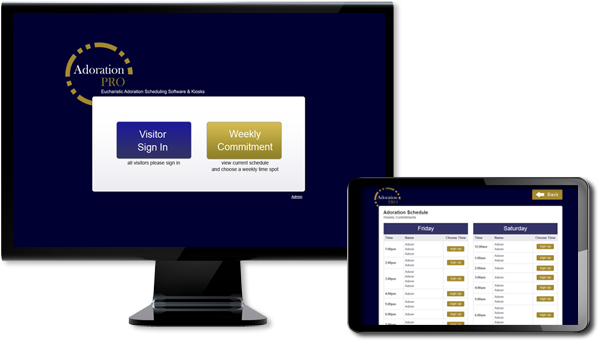 With Adoration Pro, you can promote Adoration in the bulletin, on the website, and via email. Provide the simple website link, and users can sign themselves up right when they are thinking about it. They don't have to call you, email you, or wait to see a list of open hours. They sign up, start receiving their reminder emails, and that is that. The mere addition of the software is a reason to talk about and promote Adoration in your parish. Throw in the mountable tablet kiosk and your Adoration program will start grabbing the attention of anyone just walking by the chapel.